(Los Angeles, CA) Tech N9ne protégé and longtime collaborator, Stevie Stone, is preparing for the release of his Strange Music debut album, Rollin’ Stone. Due in stores June 12, the collection features the singles “808 Bendin’,” “Get Buck” and “Oneness.” Guests on the album include Tech N9ne, Yelawolf, Krizz Kaliko, Hopsin and reggae star Peter “Peetah” Morgan of Morgan Heritage. Stone signing to Strange Music almost seemed predestined. In a remarkable twist of fate, Tech N9ne actually attended Stevie Stone’s first live performance. “I knew he was dope back then,” Tech says. Tech and Stone met after that show several years ago and started developing a relationship. 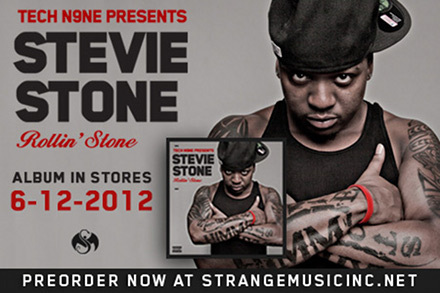 As he prepares for the release of Rollin’ Stone, Stevie Stone is currently on tour with Tech N9ne, MGK and Krizz Kaliko as part of the groundbreaking Hostile Takeover 2012 Tour, which includes 90 shows in 99 days, making it the longest consecutive tour in rap history.